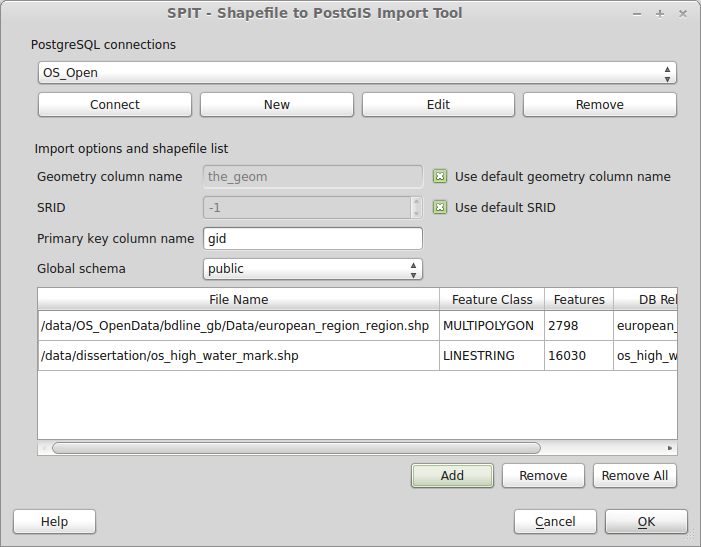 Loading data to PostGIS using SPIT. 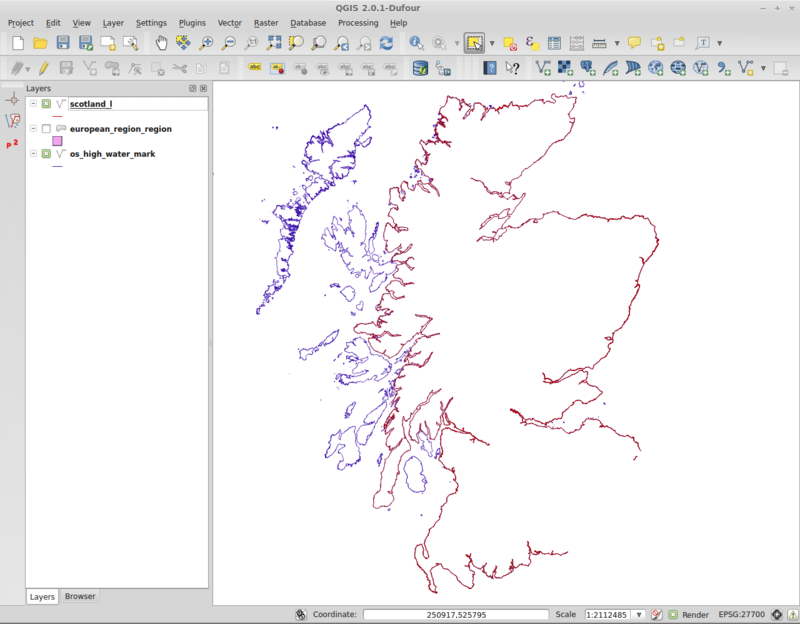 Reprojecting raster data using QGIS. Lines within a polygon selection in PostGIS. 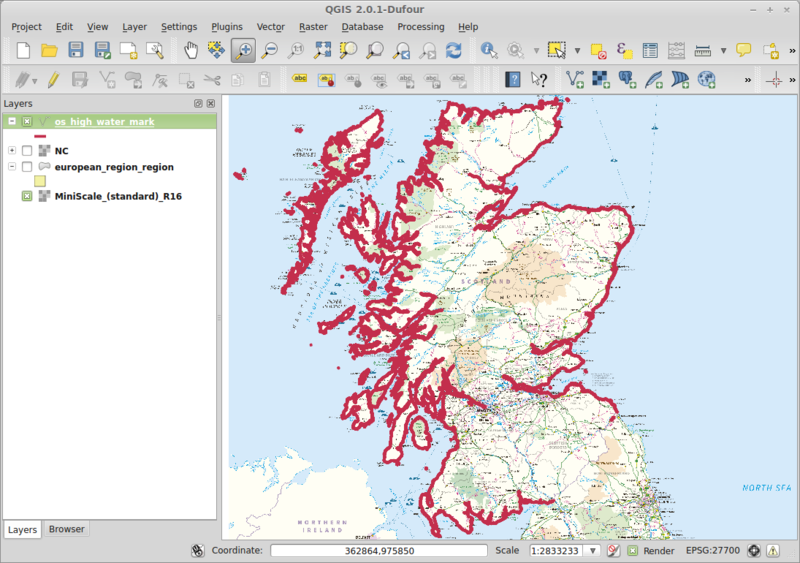 Georeferencing vector files using ogr2ogr, search for “The georeferencing:” to skip the other steps. 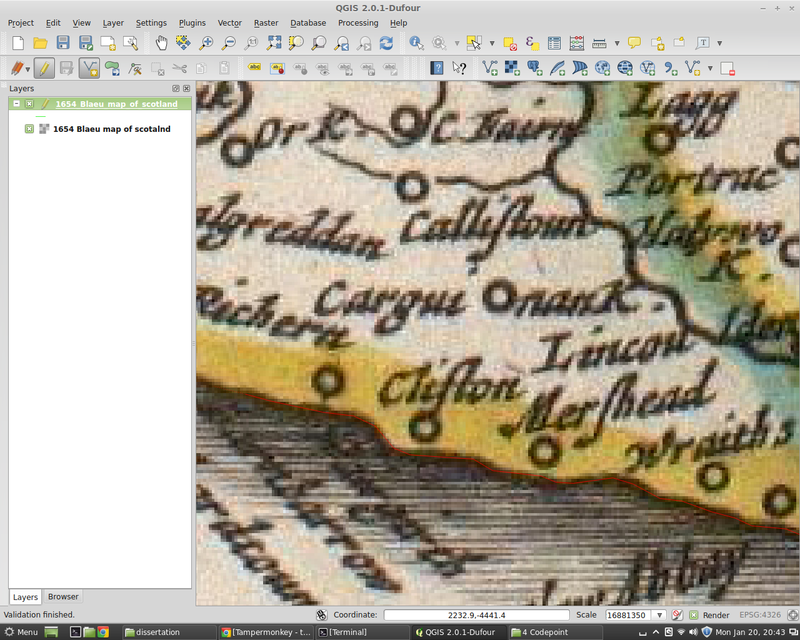 Georeferencing vector data has long been very difficult using the open-source GIS stack. That has all changed with the release of GDAL 1.10.0. 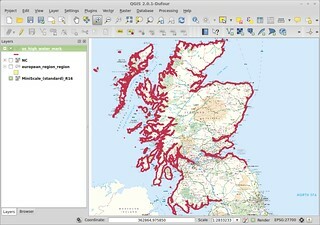 Now georeferencing can be done using the vector translator ogr2ogr. About half a decade ago I wrote my undergraduate dissertation on: “The influence of the Blaeu Atlas of Scotland on subsequent maps of Scotland”. 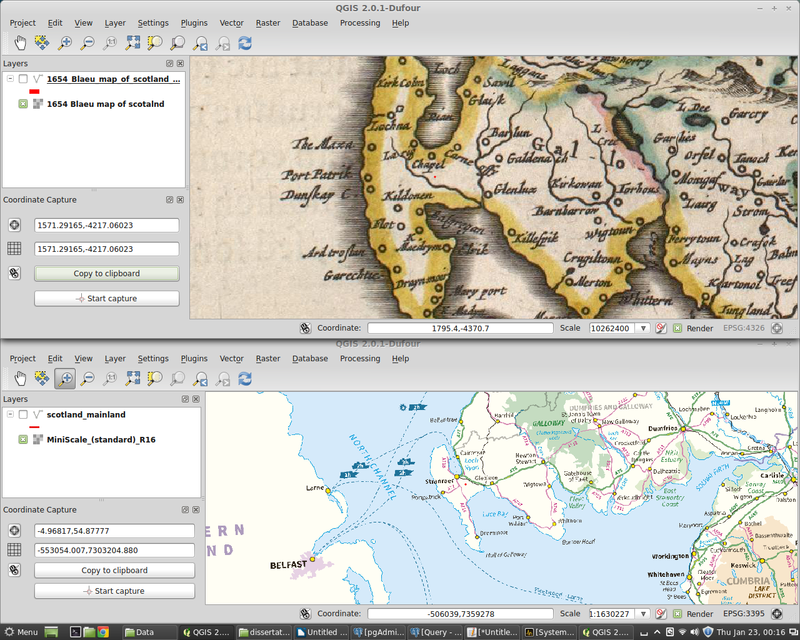 While I was very proud of the work at the time, and the grade was good, the markers comments could be paraphrased as: A very good literature review on the Blaeu Atlas, however somewhat weak on analysis”. After a Master’s degree I could not agree more. At the time I lacked the knowledge and experience of working with projections. The release of GDAL 1.10.0 gives the perfect opportunity to return and correct those mistakes. One of my favourite aspects of the Blaeu analysis was a comparison of the Blaeu 1654 Atlas of Scotland coastline to the coastline of subsequent maps of Scotland. I originally did this in GIMP and manually resized the outlines to close approximations. The end result looked good, but it lack real scientific rigour. With the Blaeu outline captured we need a basemap to georeference it to. In the end we want to re-projectiong it into the WGS 84 / World Mercator projection (EPSG:3395). 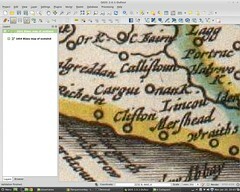 Mercator will provide a good base of what the original mapper would have been trying to capture. 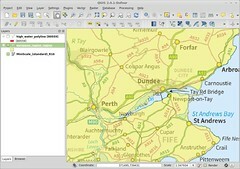 In the UK we can turn to the Ordnance Survey for a basemap, however that basemap needs to be reprojected to EPSG:3395. 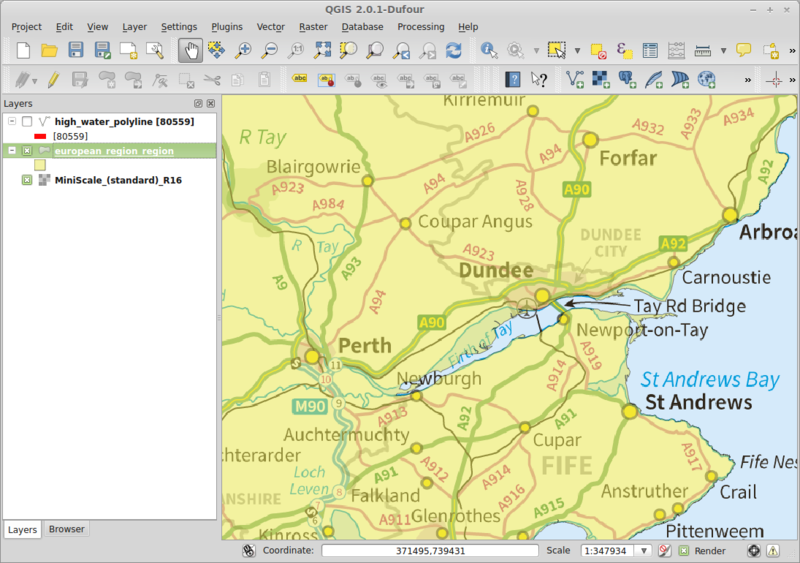 This is simply done in within QGIS by selecting the “Enable on-the-fly CRS transformation” to EPSG:3395 from Project>project Properties>CRS tab. Now we have the High Water Polyline, which looks good, but we only want mainland Scotland. Easy right? 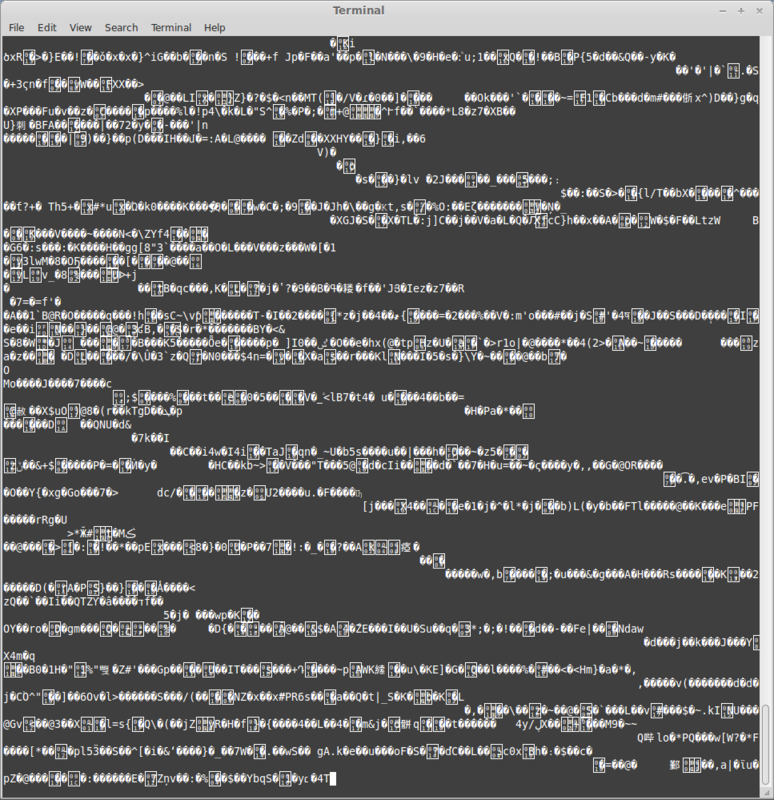 Well… slighlty more complex. 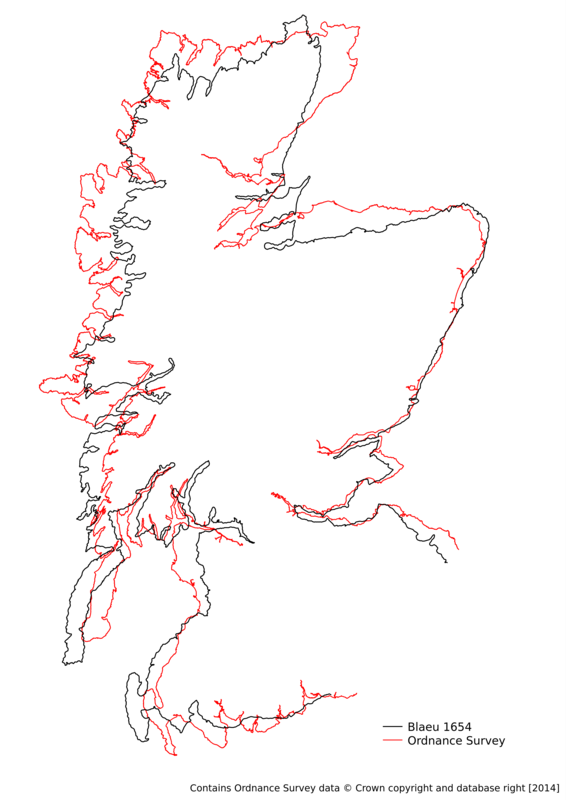 Unfortunately even the Scottish high water lines consisted of 16030 line segments. 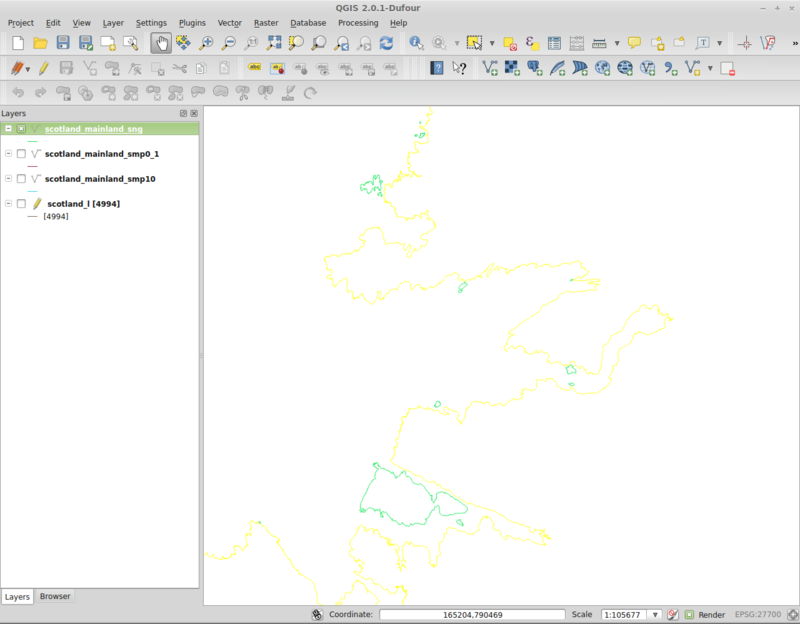 Select by location in QGIS using the European Electoral Regions (polygon) took too long (hours rather than minutes). 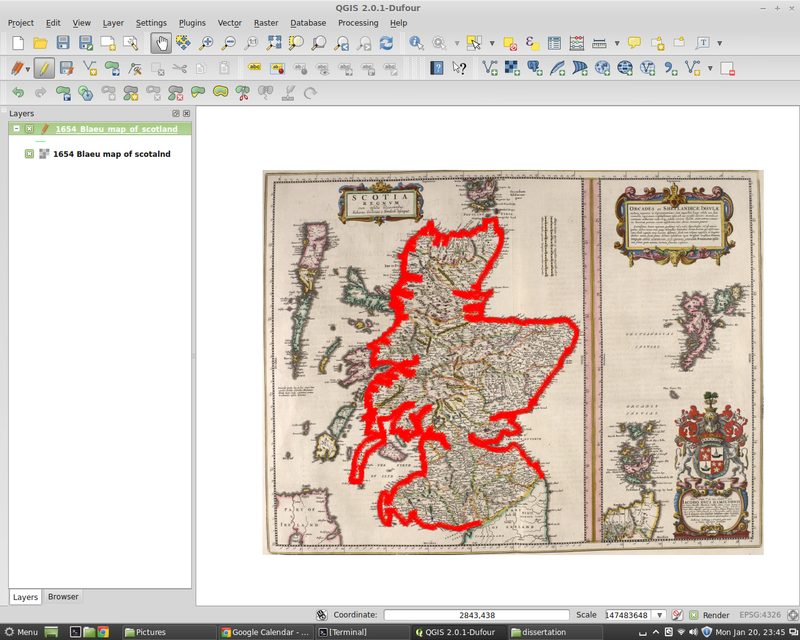 So I had to resort to PostGIS to do the selection. For setting up a PostGIS database see my previous post: Setting up PostgreSQL and PostGIS on Linux Mint. 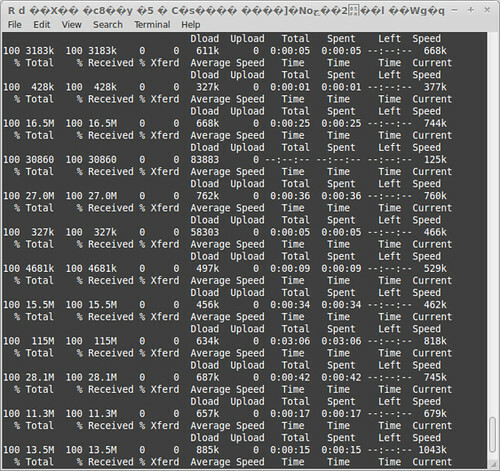 Query returned successfully: 4994 rows affected, 764779 ms execution time. The 12 minute run time says a lot about my poor computer. 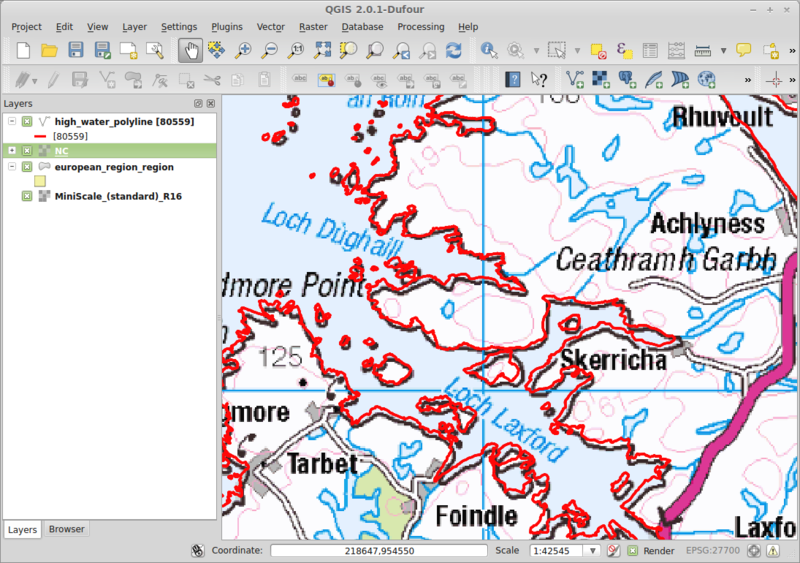 We now have a cartesian vector file ready for georeferencing, an OS raster background map to use for georeferencing (OS MiniScale) and an OS vector outline BoundaryLine (High Water Polyline) to use for the final comparison. 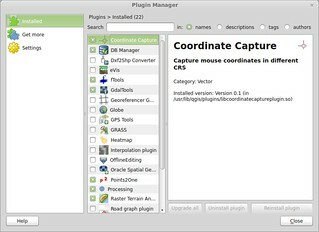 Using the co-ordinate capture tool, we capture the same point from both projects. Basically we are just capturing co-ordinate pairs from the two maps. The “Copy to clipboard” feature comes in very handy here. Of note here is that the co-ordinate capture tool captured the co-ordinate twice for me. How it works is that it captures one in the original CRS and the selected one. It is also important to keep your co-ordinates in order. I captured the cartesian co-ordinates on the first row and the WGS84 ones on the second row. Also I have attached memorable names to the points, in case there is an issue, the culprit point can be easily be identified. After the points are captured we switch to ogr2ogr to perform the actual reprojection and to convert the OS outline into World Mercator. One -gcp tag for each point. Means that it will use the a first order polynomial transformation, so affine. For myself the less distortion the better. Blaeu Atlas Maior of 1665 – Including the atlas of Scotland. This entry was posted in Blaeu, GDAL, ogr, OSGeo, PostGIS, QGIS, Tutorials on 02/17/2014 by Heikki Vesanto. 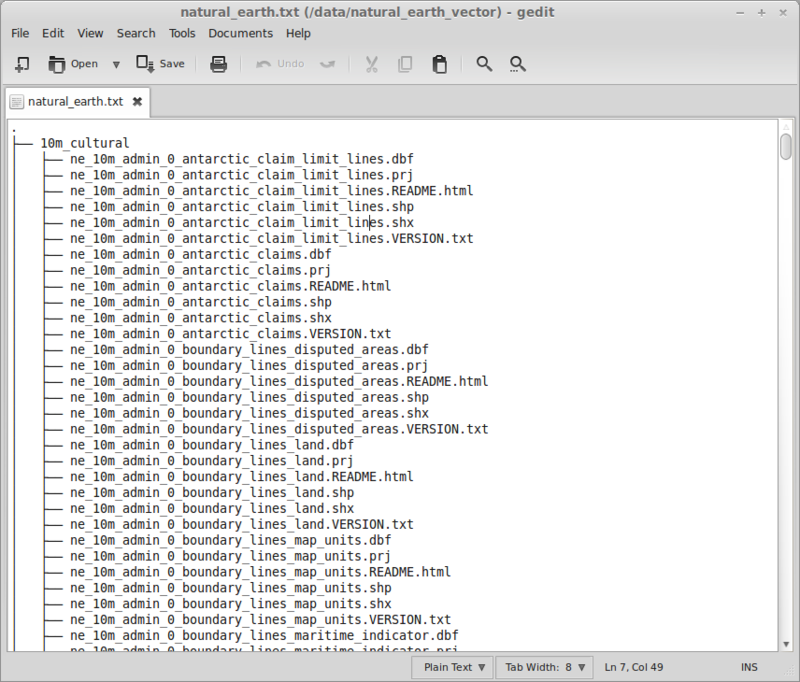 Natural Earth provides some of the best data for large scale mapping. It is clean, accurate, extensive, at a number of different scales, and best of all free. 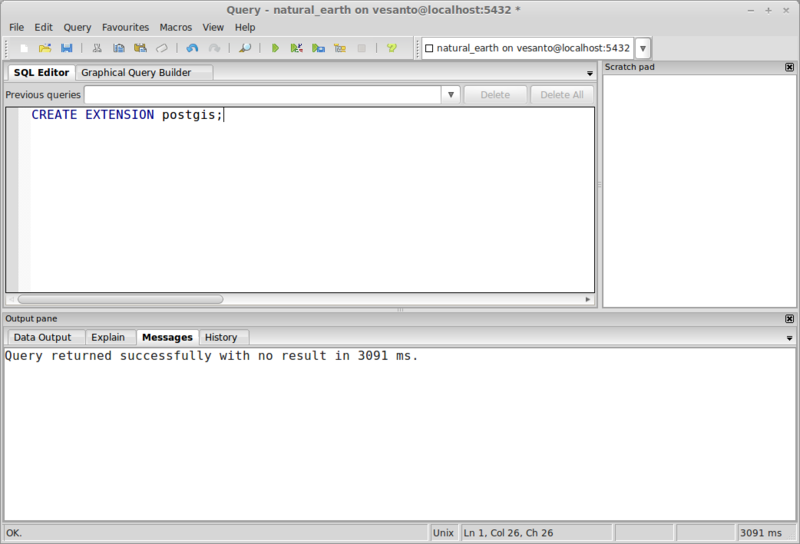 To load the data it into PostGIS (PostgreSQL) we will use the vector tools provided in GDAL. Mainly ogr2ogr. After downloading the data. 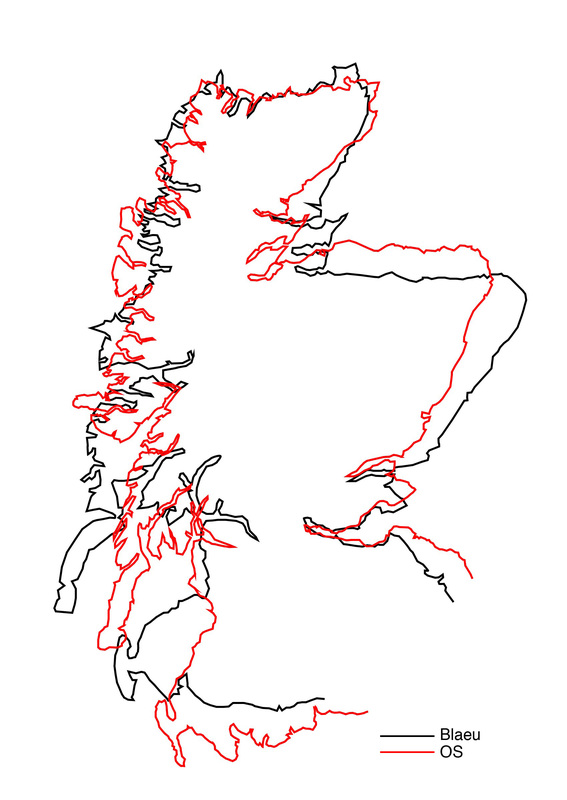 I went for all of the vector data in ShapeFile format. 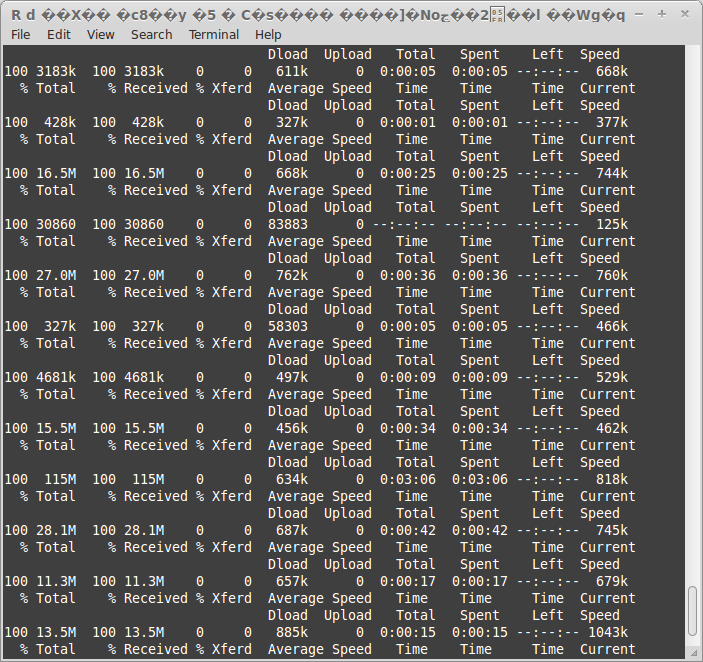 First I need to generate a list of datasets and their respective file paths. This will be put into a spreadsheet and the command to load the data will be applied to each line, and finally it will be run using a shell script. 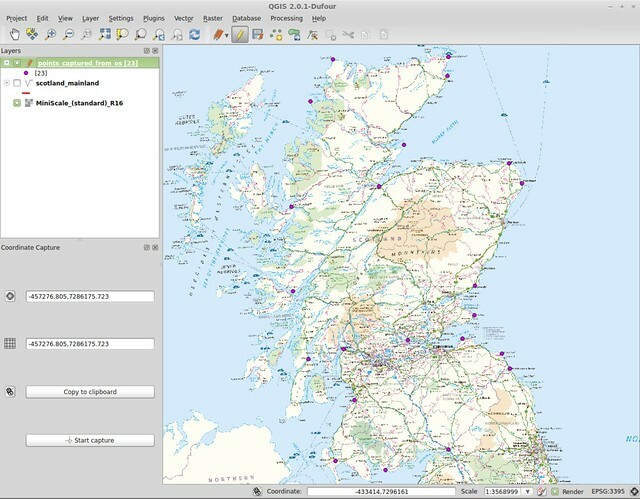 Setting up a PostGIS database is covered in my previous post. So a little automation is needed. Interestingly there were also a few .gdb files “ne_10m_admin_1_label_points.gdb”. Those we can look into at a later date. Produced a decent result, but not quite what I was looking for. Was much better, although with a bit more tuning I’m sure ls would have achieved a better result. After a bit of work in the spreadsheet, I had what I wanted. Perhaps not the most elegant solution, but certainly enough for my purposes. Ogr2ogr is a file converter, which does so much more. 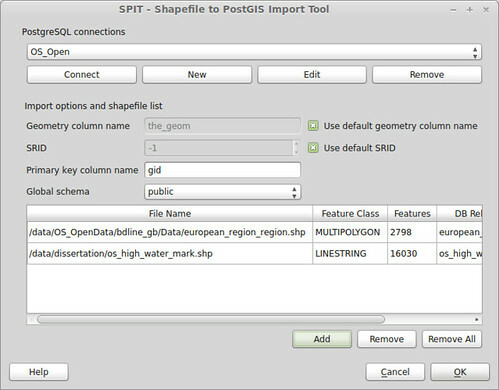 In this case we are converting the ShapeFiles into tables in a PostGIS database. 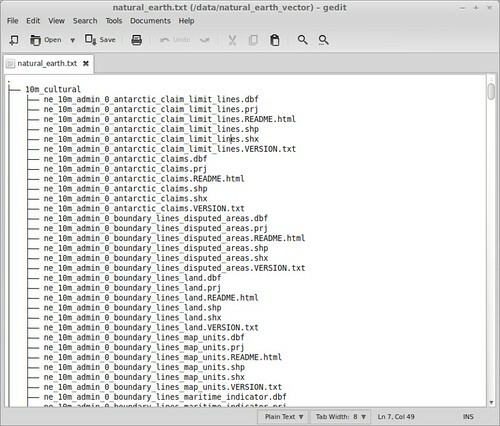 Essentially you want to copy the beginning part of the command in front of the files you want to load, changing only: “10m_cultural/ne_10m_admin_0_antarctic_claim_limit_lines.shp” . -nlt PROMOTE_TO_MULTI | Loads all out files as if they were multi-part polygons. This means that a multi-part polygon wont fail the loading. This is a PostGIS requirement. -progress | Shows a progress bar. -skipfailures | Will not stop for each failure. -overwrite | Overwrites a table if there is one with the same name. Our tables will be called whatever the ShaeFile is called since we are not specifying a name. -lco PRECISION=no | Helps keep numbers manageable, especially with this data where precision is not important. -f PostgreSQL PG:”dbname=’DatabaseName’ host=’IpAddressOfHost’ port=’5432′ user=’Username’ password=’Password'” | Details of the database where we are connecting to. Now we are ready to run the commands. While ogr2ogr commands can be pasted straight into the terminal, for this task that is not really feasible. So we can create a simple shell script. After which the file loaded swimmingly. 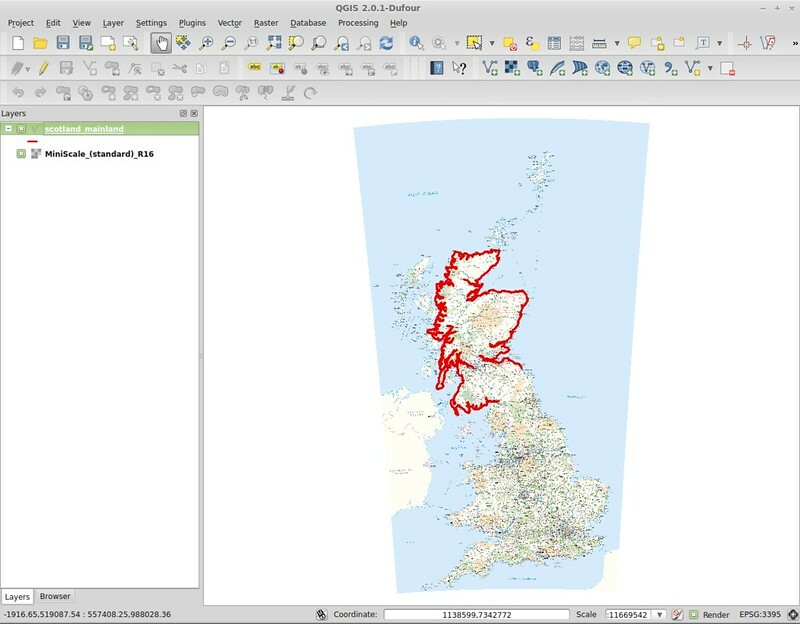 This entry was posted in Data, ogr, PostGIS, Tutorials on 02/11/2014 by Heikki Vesanto. 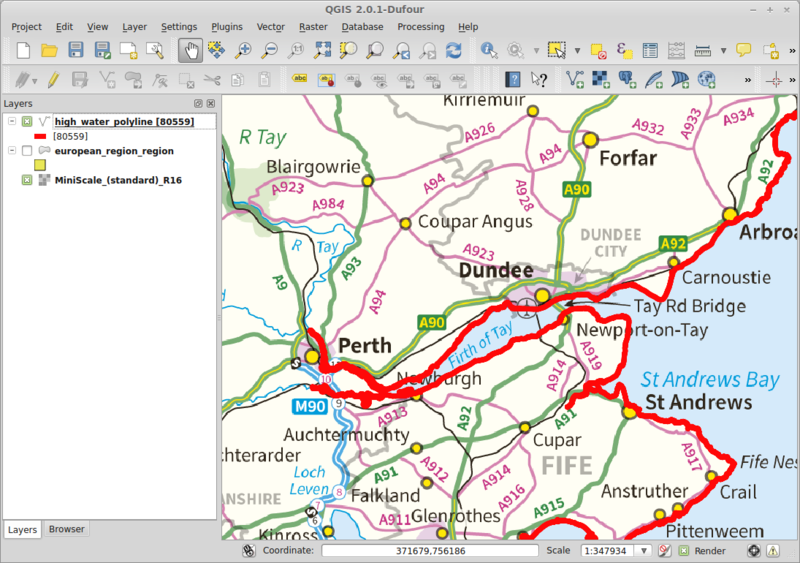 I have just ordered a new home server to store all of my GIS data, so I have put together a quick guide on setting up PostGIS on Linux Mint, setting it up on Ubuntu will be very similar. The command sets the password for the root user ‘postgres’ and sets up your own user account with privileges to create databases and users. In my case it was natural_earth. 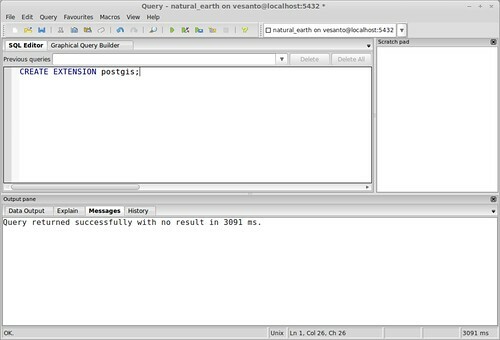 PostGIS is an add-on to a PostgreSQL database that that makes it spatially enabled. To install PostGIS we can launch pgAdmin, which is used to administer PostgreSQL database. As we can see we have the default ‘postgres’ databse and the one just created ‘natural_earth’. 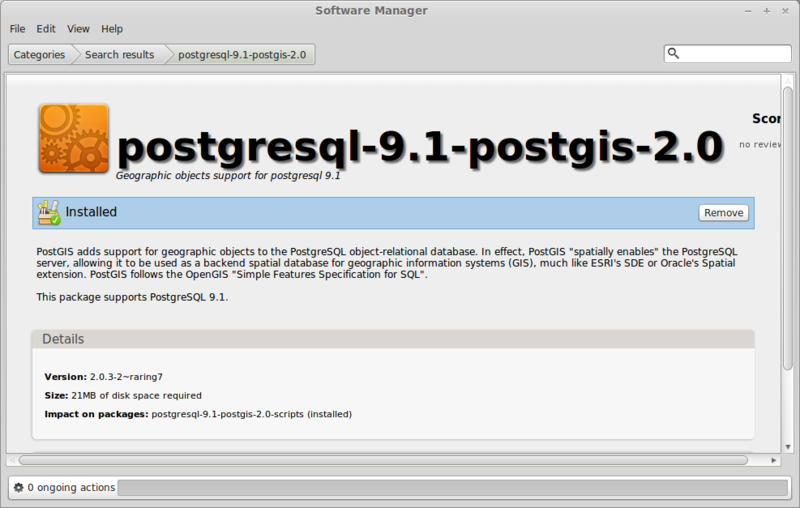 If you cannot find PostGIS it may be due to a missing personal repository, UbuntuGIS. It is a PPA (Personal Package Archive). 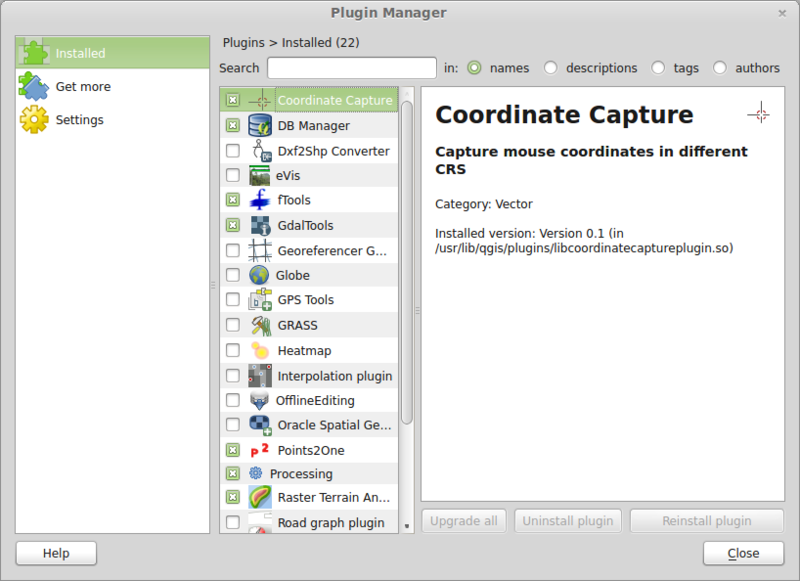 In Software Manager it can be added from Edit> Software Sources> PPAs> Add a new PPA> ppa:ubuntugis/ppa. 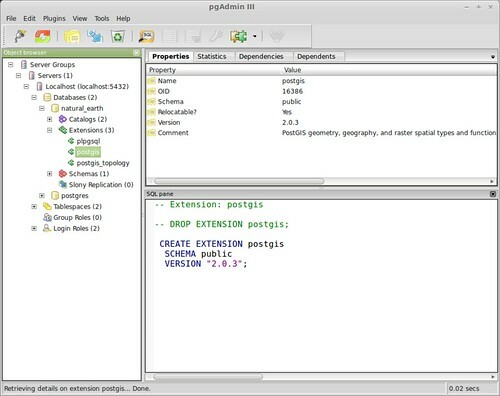 PostGIS topology can be added with the following command. 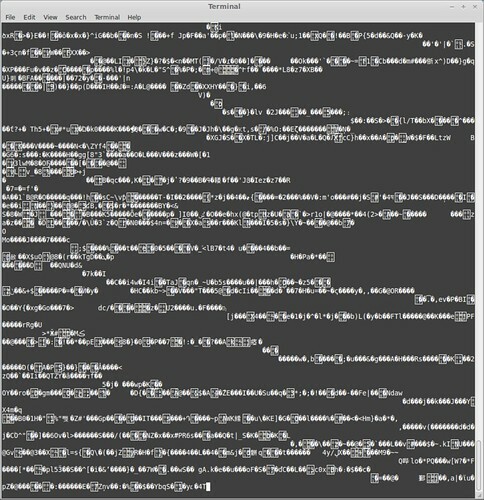 You are now ready to get started loading in your spatial data. For those interested, I have purchased a: HP 704941-421 ProLiant Micro Server for home use. 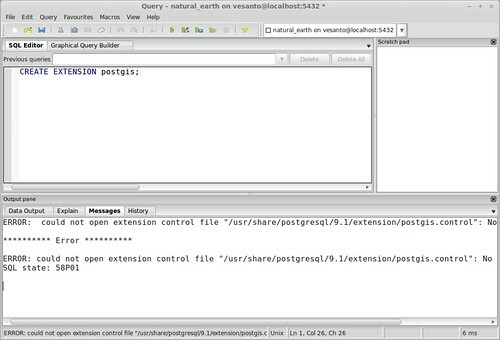 This entry was posted in Data, PostGIS, PostgreSQL, Tutorials on 02/04/2014 by Heikki Vesanto. 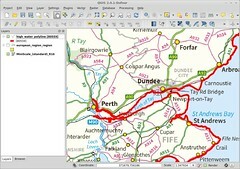 I am GIS professional based in Scotland. I hope to provide interesting, and primarily open source, projects with an emphasis on Scotland and the UK. This entry was posted in All on 02/01/2014 by Heikki Vesanto.